By Robert J. Moore, Jr. and Michael Haynes. When the Lewis and Clark Expedition crossed a continent in 1803 to 1806, they started out in U.S. Army uniforms, which gradually had to be replaced with simple leather garments. For parts of those uniforms, only a single drawing, pattern, or example survives. 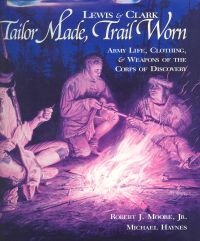 Historian Moore and artist Haynes have researched archives and museums to locate and verify what the men wore, and Haynes has painted and sketched the clothing in scenes of the trip. Also included are Indian styles the men adopted, and the wardrobes of the Creole interpreters and the French boatmen. Weapons and accessories round out this complete record of what the expedition wore or carried--and why. A great reference for artists, living history performers, museums, and military historians. 288 pages, 10 3/8" x 10". Hardbound.